Twenty-nine years have now passed since the Mother Church established the Feast of Indiction as the “Day of Protection of the Environment.” Throughout this time, the Ecumenical Patriarchate has inspired and pioneered various activities, which have borne much fruit and highlighted the spiritual and ecological resources of our Orthodox tradition. The Ecumenical Patriarchate’s ecological initiatives provided a stimulus for theology to showcase the environmentally-friendly principles of Christian anthropology and cosmology as well as to promote the truth that no vision for humanity’s journey through history has any value if it does not also include the expectation of a world that functions as a real “home” (oikos) for humanity, particularly at a time when the ongoing and increasing threat against the natural environment is fraught with the possibility of worldwide ecological destruction. This evolution is a consequence of a specific choice of economic, technological and social development that respects neither the value of the human being nor the sanctity of nature. It is impossible to truly care for human beings while at the same time destroying the natural environment as the very foundation of life, essentially undermining the future of humanity. Although we do not consider it appropriate to judge modern civilization on the grounds of criteria related to sin, we wish to underscore that the destruction of the natural environment in our age is associated with human arrogance against nature and our domineering relationship toward the environment, as well as with the model of eudemonism or disposition of greed as a general attitude in life. As incorrect as it is to believe that things were better in the past, it is equally unfitting to shut eyes to what is happening today. The future does not belong to humanity, when it persistently pursues artificial pleasure and novel satisfaction – living in selfish and provocative wastefulness while ignoring others, or unjustly exploiting the vulnerable. The future belongs to righteous justice and compassionate love, to a culture of solidarity and respect for the integrity of creation. This ethos and culture are preserved in Orthodoxy’s divine and human ecclesial tradition. The sacramental and devotional life of the Church experiences and expresses a Eucharistic vision, approach and use of creation. Such a relationship with the world is incompatible with every form of introversion and indifference to creation – with every form of dualism that separates matter from spirit and undermines material creation. On the contrary, the Eucharistic experience sensitizes and mobilizes the believer toward environmentally-friendly action in the world. In this spirit, the Holy and Great Council of the Orthodox Church emphasized that “in the sacraments of the Church, creation is affirmed and human beings are encouraged to act as stewards, protectors and ‘priests’ of creation, offering it in doxology to the Creator” (Encyclical, par. 14). Every form of abuse and destruction of creation, along with its transformation into an object of exploitation, constitutes a distortion of the spirit of the Christian gospel. 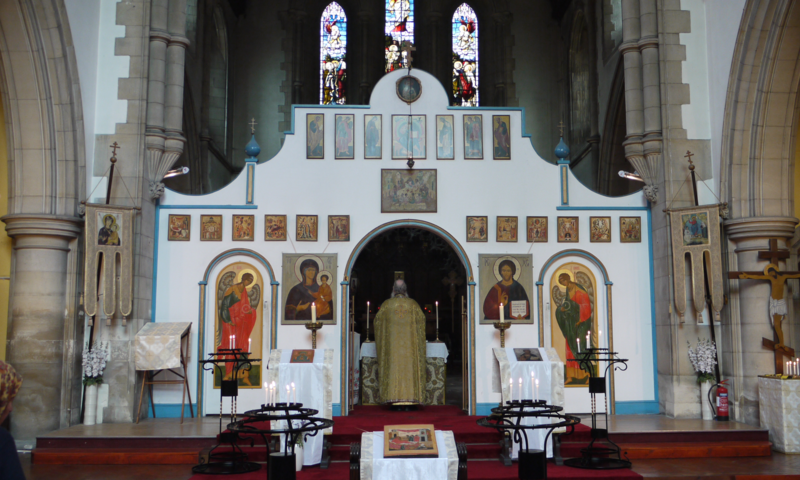 It is hardly coincidental that the Orthodox Church has been characterized as the ecological expression of Christianity inasmuch as it is the Church that has preserved the Holy Eucharist at the core of its being. Consequently, the Ecumenical Patriarchate’s ecological initiatives were not simply developed in response or in reaction to the modern unprecedented ecological crisis, but as an expression of the Church’s life, an extension of the Eucharistic ethos in the believer’s relationship to nature. This innate ecological conscience of the Church was boldly and successfully declared in the face of the contemporary threat to the natural environment. The life of the Orthodox Church is applied ecology, a tangible and inviolable respect for the natural environment. The Church is an event of communion, a victory over sin and death, as well as over self-righteousness and self-centeredness – all of which constitute the very cause of ecological devastation. The Orthodox believer cannot remain indifferent to the ecological crisis. Creation care and environmental protection are the ramification and articulation of our Orthodox faith and Eucharistic ethos. It is clear, then, that in order to contribute and respond effectively to the ecological challenge that we face, the Church recognize and research the relevant issues. We all know that the greatest threat to our world today is climate change and its destructive consequences even for our survival on the planet. This topic was paramount in the 9th Ecological Symposium, entitled “Toward a Greener Attica: Preserving the planet and protecting its people,” organized by the Ecumenical Patriarchate last June on the Saronic Islands of Spetses and Hydra. Unfortunately, the recent devastating fires in Attica and the impending consequences of this immense environmental destruction constitute tragic proof of the views shared by the symposium participants on the severity of the ecological threat. The ecological culture of the Orthodox faith is the realization of its Eucharistic vision of creation, summarized and expressed in its church life and practice. This is the Orthodox Church’s eternal message on the issue of ecology. The Church preaches and proclaims “the same things” “at all times” in accordance with the unassailable words of its Founder and Leader, that “heaven and earth will pass away, but my words will not pass away” (Lk. 21:33). Adhering to this tradition, the Mother Church calls upon its Archdioceses and Metropolises, as well as its parishes and monasteries throughout the world, to develop initiatives, coordinate projects, organize conferences and activities that foster environmental awareness and sensitivity, so that our faithful may realize that the protection of the natural environment is the spiritual responsibility of each and every one of us. The burning issue of climate change, along with its causes and consequences for our planet and everyday life, offer an opportunity to engage in dialogue based on principles of theological ecology, but also an occasion for specific practical endeavors. It is vitally important that you emphasize action at the local level. The parish constitutes the cell of church life as the place of personal presence and witness, communication and collaboration—a living community of worship and service. Special attention must also be directed to the organization of Christ-centered educational programs for our youth in order to cultivate an ecological ethos. Ecclesiastical instruction must instill in their souls a respect for creation as “very good” (Gen. 1:26), encouraging them to advocate and advance creation care and protection, the liberating truth of simplicity and frugality, as well as the Eucharistic and ascetic ethos of sharing and sacrifice. It is imperative that young men and women recognize their responsibility for the practical implementation of the ecological consequences of our faith, while at the same time becoming acquainted with and promulgating the definitive contribution of the Ecumenical Throne in the preservation of the natural environment. In conclusion, we wish you all a blessed ecclesiastical year and abundant benefit in your spiritual struggles, invoking upon you the life-giving grace and boundless mercy of the Giver of all good things, our Lord, God and Savior Jesus Christ, the Pioneer and Perfecter of our faith, through the intercessions of Panaghia Pammakaristos, whose honorable icon, the sacred heirloom of all Orthodox people, we reverently and humbly venerate today. Your fervent supplicant before God.